For the former UK supermarket, see Sainsbury's Savacentre. Sava Centar (Serbian: Сава Центар) is an international congress, cultural and business centre of various multi-functional activities located in Belgrade, the capital of Serbia. It is the largest audience hall in the country and entire former Yugoslavia and one of the biggest in Europe. It has been host to numerous large-scale events and performances. Sava Centar is located in the Block 19, in the municipality of New Belgrade. It is situated at 9 Milentija Popovića street. The complex is bounded by the streets of Vladimira Popovića to the east, Milentija Popovića to the west and Bulevar Arsenija Čarnijevića to the south. To the north are other buildings, which occupy the northern section of the Block 19, including the Crowne Plaza Belgrade and Savograd. 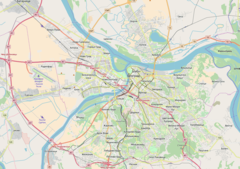 In 1975, after the First Conference of the Organization for Security and Co-operation in Europe, held in Helsinki, Finland, the President of Yugoslavia Josip Broz Tito accepted that Belgrade will host the next summit. However, Belgrade had no congressional facility which could accept so many delegates so it was decided to build a new object. The author of the project, chief designer and team manager was Stojan Maksimović, who had only one month to submit the concept. Maksimović spent that month either in seclusion in his office in the City Hall or on the planes, visiting Paris, Copenhagen and Helsinki to see the existing facilities of this type. Works began in 1976 and after a bit over a year, the object was ceremonially opened on 14 May 1977 by Tito. Works on the first stage had to be rushed due to the scheduled OSCE conference. This date is today marked as the birthday of Sava Centar, though it was only opening of Block A, followed by Block 2 in 1978 and Block 3 in 1979. The second phase, a large performance and conference hall, opened on the occasion of the 11th Congress of the League of Communists of Yugoslavia. The planned stage at the main hall, which had been fancied as revolving, was scrapped and a fixed large stage was placed instead. By 1979, Hotel Beograd InterContinental, now the Crowne Plaza Belgrade, was added to the complex to host the annual meeting of the World Bank. Supporting architecture such as roads and highway conjunctions were also built during this period around the Sava Centar complex. The complex, due to its design and speed by which it was finished, attracted international attention. It was among the nominated projects when the inaugural Pritzker Architecture Prize was awarded in 1979. Local press of the day named it "spaceship", "glass garden", "beauty on the Sava", "concrete ship of peace", "goodwill house", etc. On 17 August 2006, the parking lot at Sava Centar was renovated to capacitate 410 cars. As a result of the renovation parking fees were introduced for the first time at Sava Centar but are as of 2016/2017 lifted. In its jubilee year of 2007, when Sava Centar marked its 30th anniversary, a substantial financing was utilized on the reconstruction of the glass façade. Also, the city authorities funded the reconstruction of broken glass on the sideways-facing façade, acquisition of the stage audio equipment for concert appearances and replacement of the main hall seats. As of 2017, the 40-years old complex is in a bad financial situation. After it was built, investments into preserving and enhancing the object were minimal. City, which owns the facility, decided to find a strategic partner who will take 49%, while the city will retain 51% in the future joint company. The bidding was announced in 2016 and two companies, Delta Holding and a consortium headed by the Belgrade's Nikola Tesla Airport showed interest. City then prolonged some of the dates and decided to change some of the conditions of the bidding, so Delta Holding backed off. After the second bidding, the Airport also withdrew not giving any reasons. When the third bidding was announced in June 2017, no one applied. In November 2017 the city hall announced another bidding in the future, but ordered to three city companies (Belgrade power plants, Cleaning and Belgrade waterworks and sewage) to write off all the claims they have from Sava Centar, in order to make it more attractive for the buyers. The bidding was open in December, with city asking for at least €12.5 million. Despite writing off lots of debts, Sava Centar remained one of the Serbian companies with highest tax debts with 558 million dinars (€4.7 million) in the early 2018. Delta Holding reappeared as an interested investor, claiming willingness to invest double what the city is asking and to build a footbridge to the future Hotel Intercontinental, planned by the Delta Holding in the vicinity. Instead of announcing the bids, city extended the deadline to 20 March 2018. Delta Holding was the only bidder but their application was rejected as "incomplete". The commission executing the bidding recommended the direct negotiations with the company, which city administration accepted in July 2018, before changing its mind again in February 2019, opting for the concession. Sava Centar has 69,720 m2 (750,500 sq ft) of useful and 100,000 m2 (1,100,000 sq ft) of overall area, including a theatre hall with 4,000 seats, 15 conference halls, an exhibition area and a number of other facilities. It annually hosts more than half million visitors. Sava Centar is connected to Crowne Plaza Belgrade via an underground hallway. The complex includes restaurants, bars, offices and shops. The great hall, nicknamed the blue hall due to its blue seats is the largest audience hall in the country with the above-mentioned 4,000 seats, both ground and upper level included. The hall has the ability to completely change its look depending on the stage set-up. As a result, the seats can be taken out. It is also the place major cinema premiers are hosted. Panoramic photo of Sava Centar. Sava Centar has hosted among others Gennady Rozhdestvensky, Zubin Mehta, Valery Gergiev, Eiji Oue, Mstislav Rostropovich, Henryk Szeryng, Ivo Pogorelić, Vladimir Ashkenazy, Plácido Domingo, Montserrat Caballé, Johan Strauss Orchestra, Moscow Philharmonic Orchestra, The USSR Ministry Of Culture Orchestra, National Symphony Orchestra (NSO), Okazu Philharmonic Orchestra, Belgrade Philharmonic Orchestra, Metropole Orchestra, Miles Davis, Dizzy Gillespie, Nina Simone, Ray Charles, John Mayall & the Bluesbreakers, Jerry Lee Lewis, Julio Iglesias, Jeff Beck, Buddy Guy, Suzanne Vega, Nigel Kennedy, B.B. King, Lou Reed, Roxy Music, Jethro Tull, Sting, David Byrne, Simple Minds, Laurie Anderson, Samantha Fox, Jason Donovan, Slobodan Trkulja, Bilja Krstić, Gotan Project and Madredeus. It also serves as the venue of the Miss Serbia competition, the Serbian Eurovision Song Contest selection music festivals, Beovizija and was the host place of the Jugovizija (in 1987). Sava Centar has been the host of significant congress gatherings and artistic programs: Organization for Security and Co-operation in Europe, Annual General Meeting of the International Monetary Fund and the World Bank, 55th Annual General Meeting of Interpol, 6th United Nations Conference on Trade and Development, General Meeting of UNESCO, FOREX, FISIT and 9th Summit of the non-aligned countries. In January 1990, Sava hosted the 14th (and last) Congress of the League of Communists of Yugoslavia. In total, from May 1977 to May 2017, over 35,000 events of all kinds were held in the venue, with a total of 15 million visitors, of that 10,000 congressional meetings with 2 million participants. In June 2018, it held the 6th WordCamp Europe. Sava Centar in cylindrical perspective. ^ ""Delta" odustaje, šta će biti sa Sava centrom?" (in Serbian). B92. 15 December 2016. ^ Maja Đurić (28 January 2018). "Neizvesna sudbina Sava centra, od dugova do rekonstrukcije" [Uncertain destiny of Sava Centar, from debts to reconstruction] (in Serbian). N1. ^ Ana Vuković (1 February 2018). ""Delta" ne odustaje od "Sava centra"" ["Delta" is not giving up on "Sava center"]. Politika (in Serbian). p. 17. ^ Ana Vuković (20 July 2018). "Директни преговори с "Делтом" о "Сава центру"" [Direct negotiations with "Delta" about "Sava Centar"]. Politika (in Serbian). p. 12. ^ Ana Vuković (27 February 2019). "Grad će ponuditi "Sava centar" na koncesiju" [City will offer "Sava Centar" to a concession]. Politika (in Serbian). p. 17. ^ "Sava City". Beobuild. 5 January 2011. ^ Davor, Pauković, (2008-12-22). "Last Congress of the League of Communists of Yugoslavia: Causes, Consequences and Course of Dissolution". Contemporary Issues (in Croatian). 1 (1). ISSN 1849-2428. ^ "Location". WordCamp Europe 2018. 2017-10-17. Retrieved 2018-06-19. Wikimedia Commons has media related to Sava Centar. This page was last edited on 30 March 2019, at 18:37 (UTC).